3/47: Open plan living with beautiful vaulted ceilings. 4/47: West Bay Beach looking North, standing directly in front of the house. 5/47: Large kitchen with bar top and plenty of counter space for entertaining. 6/47: Master bedroom with bed. 7/47: Step right off your deck into the white sands and turquoise waters of the caribbean Sea. 8/47: West Bay Village from the water. 9/47: Kick back and enjoy the sunsets from your beach front deck. 12/47: West Bay Village beach. 13/47: Looking at the deck from the front garden. 18/47: A great place to relax and enjoy the view. 19/47: Large kitchen, great for entertaining. 20/47: Plenty of dining space inside and outside. 22/47: Living room with local cable t.v. Apple t.v. and Wifi. 26/47: Living room with local cable & Apple T.V. 28/47: The beach in front of Casa Martin & West Bay Village. 43/47: Third bedroom set up as a king. Casa Martin is the quintessential beach house. It is constructed of wood with wood siding. There is an open floor plan to the living area that flows out to the large, shaded deck. The deck provides guests with direct access to their own private beach garden. West Bay Beach is just beyond that, and the best snorkeling is less than a two-minutes’ flipper kick away. This exceptional beachfront rental has a king sized master suite with large bathroom. The suite includes two arm chairs which easily convert into small sofa sleepers, suitable for children under 10 years. It has a queen bedroom with en-suite bathroom plus a third bedroom containing two twins (beds can be configured as a king for a couple). A separate bathroom accommodates the third bedroom. All bedrooms are furnished with luxurious locally made Honduran furniture. Attention to detail and high quality linens add comfort and luxury to this incredible beach house. The living space is open and airy, with tiled floors and a vaulted ceiling. The kitchen has room for everyone, and is well equipped for any meal. The cabinets are made of Honduran hardwood with granite countertops. Off the kitchen is a handmade dining table with seating for 6 (and chairs and room for 8). This flows into the living area complete with comfortable couches, and a flat screen TV with Apple TV. There is another table that offers views of the beach and sea. The whole space is filled with large screened windows and two huge sliding glass doors that lead out to the deck. The screened windows allow guests to enjoy the island breezes, but the entire space is also air conditioned. Guests will find they spend most of their time on the beautiful deck overlooking the Caribbean. There is a dining table for 8, comfortable lounge seating (arriving December, 2016) and hammocks. A gas grill is provided, as well as an old charcoal grill should guests prefer. The entire deck is covered and kept cool with ceiling fans. Steps down from the deck is a private beach garden for Casa Martin guests, and beyond that are the beach loungers for West Bay Village. Casa Martin is located in the sanctuary of West Bay Village, a cozy collection of 8 Caribbean-style homes located right on West Bay Beach. Each home is private in its own space, yet close enough to your neighbor to make it easy for a quick visit. This area is popular with groups due to this convenient and private arrangement of the homes. There is a beach area that offers all WBV guests beach loungers and a marked swim area. PLEASE NOTE: The base price for this home is for 6 persons. The home can accommodate up to 8 persons on 2 chair sleepers in the master bedroom, for an extra $25 per person per night. It is a lovely house, tremendous location, everything was great, the house is as you see it in the pictures! Beautiful beach, would recommend it to everybody! REPLY: Thank you very much! Brad, Shane & Julio are extremely helpful. Made reservations at restaurants and arranged for transportation when needed.. TV and Wifi worked great. I had to watch the Final 4. If you want to relax, can't find a better place. REPLY: Thanks, Kelly, always a pleasure to have you! Casa Martin house was spectacular clean spacious. Deck was awesome. 30 steps to water from the deck. Couldnt get any better than that. REPLY: Thank you very much, that sure sums up Casa Martin! We hope you can come back and visit again soon. Everyone is fabulous to work with. This was our 6th visit to Roatan. We love Casa Martin and West Bay Village. Best location on West Bay Beach. We are already looking forward to our visit next year! REPLY: Thank you very much, see you next time!! 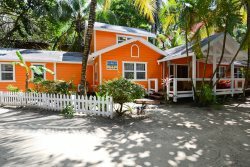 The team at Island House Vacation Rentals are very professional, knowledgeable and friendly. They were trustworthy and I felt safe at the resort. We loved our stay at Casa Martin. It was perfect for our family! It was one of our best family vacations. I can't wait to go back! REPLY: Thank you very much, Casa Martin is a very special place and we look forward to having you back. Todo el personal muy amable y profesional. Excelente equipo. Una casa muy linda, amplia, bien equipada y acogedora. Por supuesto que la recomiendo y volvera a ir! La estada all contribuy mucho a que nuestras vacaciones fuesen perfectas. REPLY: Muchas gracias, nos alegra que haya disfrutado de su estancia. Esperamos que te quedes con nosotros pronto. the property is great , best location, near to everything. REPLY: Thank you, we look forward to seeing you the next time! Loved it. We will be back next year! Everyone was great. From check in to check out it's just a great experience. Fernando was great as well as the security guard, maids and grounds crew. 2nd stay in Casa Martin. On our flight down we talked about maybe trying a different place for our next vacation. But after a another week in Casa Martin we decided that there is nothing that could be any better. It is absolute paradise for us. We will definitely be back soon. REPLY: Thank you so much for the review, we hope to see you back soon! Great house good location. REPLY: Thank you, it sure is hard to beat being right on the beach! All staff members I came in contact with were excellent. Casa Martin was excellent. Blackies dinner was adequate, but that is not part of your services, just an overall comment. Everyone got sick during our stay which detracted from an otherwise good visit. The power outages are a nuisance. RESPONSE: Thank you for your review, so sorry you all got the bug while here. Hopefully, by the next time you visit we will have the backup power situation sorted. Laundry service is available for $5 per load. Discount available for stays of 3 weeks or longer.